The poster of Shaad ali upcoming film starring Diljit Dosanjh, Taapsee Pannu and Angad Bedi has been released. 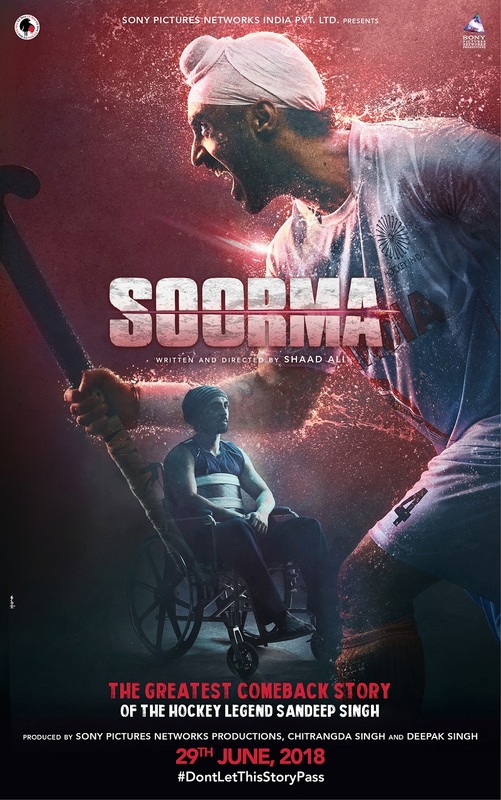 Titled Soorma, the film chronicles the life of Indian hockey legend Sandeep Singh, who also served as the captain of the Indian national hockey team. The highs and lows of the sportsman are captured in a befitting manner in the poster. Currently, The 31-year-old hockey player is employed with the Haryana Police as deputy superintendent. The film has been produced by Chitrangda Singh, Sony Pictures Networks Productions and Deepak Singh. Chitrangada had acquired the rights to the story nearly three years ago. But the film took time to actualise, as the hunt for the right actor was still on. There were speculations that Sandeep himself wanted Ranbir Kapoor to essay him in his biopic as he was highly impressed by the actor’s performance as a Sikh in Rocket Singh (2009), but the idea was dropped. The film is now slated to be released on 29 November.